RD8100PDL and PTL locators are capable of locating cable to ground faults caused by damaged cable sheaths and can also be used to locate damage to insulation on pipelines. This process is known as FaultFinding and uses specific fault find signals applied to the target. Fault find signals can only be applied using Direct Connection method. Accessory A-frame with connecting lead. Direct connection lead and earth stake. 8K Fault Find – useful for sheath faults on cables but can also be used on pipelines over shorter distances. CD Fault find (Only available on Tx-10) this low frequency signal is very useful on long distance pipelines. CD can also be used for locating sheath faults on cables. Using RD8100 standard locating techniques locate the cable or pipe for a short distance and trace and mark its route. Remove all earth bonds from the line to be traced during the fault-finding survey. 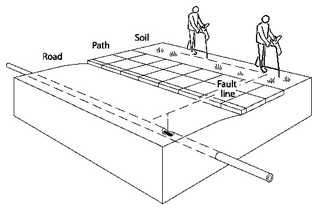 If there are any earth bonds along the path the fault find signal may direct the user to this location as this will be the preferred path for the fault find signal to leak away into the ground and may result in the fault not being located. With the transmitter switched off connect the Direct Connection lead into the transmitter accessory socket. Clip the red connection lead to the cable, cable sheath or pipe ensuring that the area around the connection is clean and that a positive connection is achieved. Extend the black connection lead as far away as possible at 90° to the probable route of the target cable and clip the connector to the ground stake ensuring that a positive connection is achieved. NOTE: Always connect the black connection lead to a ground stake and not a water pipe or buried cable, as these may carry the signal. Select a fault-finding frequency using the key. Use the or keys to increase or decrease the output signal level. If required you can use the BOOST setting if the fault is located on a high resistance cable or if the cable is long. WARNING! By selecting 8KFF the transmitter will have the ability to output high voltages and a high voltage warning icon will appear on the transmitter’s LCD. Connect one end of the connection lead to the A-frame socket. Connect the other end to the locator accessory socket. The locator will automatically recognize the A-frame connection, and display the A-frame icon. NOTE: If the locator and transmitter are iLOC enabled then you can remotely control the transmitter using the locator. Attach the locator to the A-frame by the retention hook. (If you are holding the locator separately, make sure that the locator is in line with the A-frame and is pointing towards the green spike.) The fault direction arrow should be pointing away from the ground stake. If it is not, make sure that the transmitter is connected correctly (red connector to the cable and black to the ground stake). Take the dB reading and keep it for reference. If there is a single fault on the cable, it will be approximately the same dB value as the reference reading. NOTE. To establish how often to take readings on the cable or pipe, move away from the ground stake and take further readings until the arrow has difficulty in locking and the dB reading is low. Measure the distance that the locator is now away from the ground stake. This is the distance that you can safely use between taking readings on the cable or pipe to ensure that you do not miss the fault. 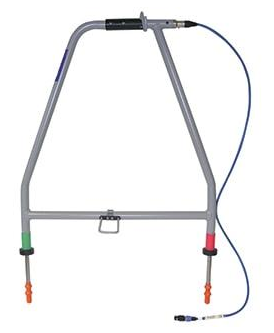 Starting from the transmitter, walk along the cable or pipe route pushing the A-Frame spikes into the ground with the green spike pointing away from the transmitter. Where there are no faults the dB reading will be low and the direction arrow may flicker forward and back. NOTE: Flickering arrows may also indicate that you may be too far away from the fault or ground stake (or both) for the locator to lock on. If you are trying to locate high resistance faults or there is a long distance between faults, carry on with the survey and the locator will lock on when you get closer to the fault. Take readings at the survey intervals determined by the reference reading. To locate the cable or pipe while using the fault find signal during a Fault-Find survey, press the key once and the locator will switch to Peak locate mode. To use alternative antenna modes, press the key to step through available antenna modes. To get back to fault find mode step through all available antenna modes until the locator goes back to fault find mode. Note: While the A-Frame is connected to the locator, depth and current measurements will not be available. If depth or current measurements are required, remove the A-Frame lead from the locator. As a fault is approached the Fault-Find direction arrow will lock on to the fault signal, point forward and the dB readings will increase. When the fault is passed the arrow will point back towards the transmitter. Take readings at smaller survey intervals to determine the exact point of the fault. When the A-frame is directly over the fault the dB reading will drop as shown opposite. NOTE: The values given are for illustration purposes only and may not be the same as those obtained in other situations. To pinpoint the fault, turn the A-frame 90° to the cable or pipe and Fault-Find until the exact point is found. Where the arrow direction changes the center line of the Aframe is now directly over the fault. Mark the ground to show the position of the fault. Find the maximum dB reading in front of the fault by pushing the A-frame into the ground at small intervals. Note the dB reading. If the reading is approximately the same as the reference reading, you can assume that there is only one fault. If the reading is less than the reference reading, keep surveying the cable for other faults. NOTE: If the cable or pipe runs under a road, use the equipment as normal on the road surface as it can sometimes detect signals when working on blacktop, concrete, or paved surfaces. If necessary, try wetting the road surface. Pouring a very small amount of water around the bottom of the A-frame spikes before each Fault-Find will generally ensure a good ground connection. NOTE: If the cable or pipe runs under a paved surface, the fault can often be pinpointed by fault finding in the grass / soil adjacent to the paving. 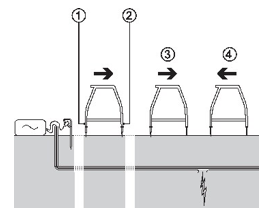 Reduce the distance between placing the A-frame spikes in the ground to allow for the increased distance to the actual fault position.